With Thanksgiving creeping up ever so slowly, I have been scouring the magazines to search for inspiration. I came across a few recipes, but did not quite have all the ingredients, so I ended up combining three I found and then added a little “Jen” and I give to you a shredded radicchio apple salad. I love how the sweetness of the apples balances out the bitterness of the radicchio. I also substituted zero calorie Walden’s Mayo to save on some calories, but feel free to use the real thing! 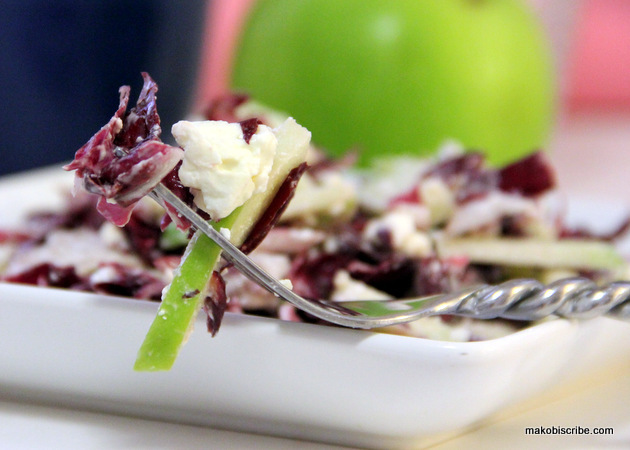 Toss together radicchio, feta, apples, and lemon juice. That’s a great recipe to take advantage of the last of the fall harvest for apples! I absolutely love radicchio, especially grilled. Great combo with the apples! Sounds like a great recipe for when I’m craving something fresh and summer-y! This recipe is one of my favorites. I love feta and apple together and could eat this every day! What a yummy summer recipe! I love apples in cold salads. Adding this to my recipes! I’m loving that this has feta!! Pinned to make later for sure!